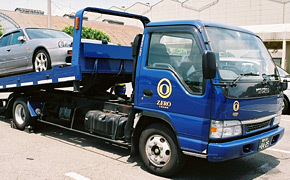 We source vehicles cost direct from Japanese auctions and ship them to clients around the world. Our direct import service is designed specifically for private buyers wanting top quality vehicles. 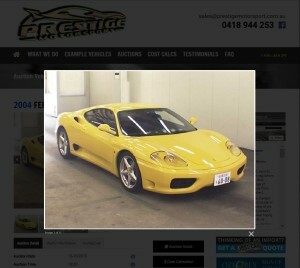 We specialise in importing vehicles to Australia. We also ship to NZ, UK, USA, Canada, Ireland, Germany, France, Norway, Sweden, and the Netherlands. We source cars and people movers only – not motorhomes, buses, trucks or motorcycles. Please note that our export agents in Japan do not ship to Pakistan, India, Bangladesh, Africa, South America or the Caribbean. 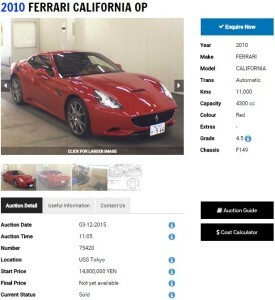 See How to Buy from Japanese Car Auctions. You pay virtually the same for export costs, shipping and compliance as any large dealer or importer would – benefit from our knowledge of the business and access to volume discounts. No hidden costs ever ! We started this business in 1999 to protect other enthusiasts like us from being overcharged and misled. Our Cost Calculator sets out the process and costs in detail. We work through this with you to set your budget. You select your own vehicle from the many choices on offer each week. We guide you gently throughout the process, and there is never any pressure. All vehicles are physically checked by our reliable agents on the ground at auction, with full details and pictures discussed with you. As we don’t own any of the vehicles, our interest is always the same as yours — accurate descriptions and finding the very best vehicle for your budget. We manage the auction bidding for you. Once successful at auction, we organise the import process efficiently with regular contact and provide assistance until your vehicle is on the road. We can also arrange to export your own vehicle if you are returning home after living in Japan, Hong Kong, Singapore and other countries. We aim to make it a simple, relaxed and enjoyable process, and we focus on being professional and helpful with good, old-fashioned customer service. Why not get in touch and see for yourself ! We advise on the best options and likely cost for your needs and situation so you can make an informed decision. We guide you on the best value for money choices, and after owning many of the popular imports ourselves we can also provide useful details about fuel economy, practicality and comfort to help you decide what is best for you and your family. One of the reasons that we have such a high client satisfaction rate is that we take the time to determine up front whether direct import can meet your expectations. Things are constantly changing and if there is a better option, we will tell you. The best thing is that our advice is always fast, free, honest and thorough — in fact we are known for it. 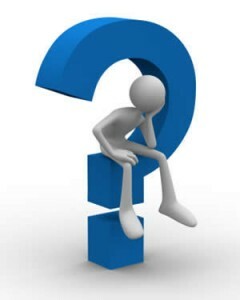 So ask as many questions as you like ! Find your next vehicle or research past auction prices using our Auction Search. View upcoming auctions plus a full 3 months of past auction sales. Search by make, model, chassis code, transmission, condition and colour. We put thousands of vehicles at your fingertips. Our auction alerts system will email you daily updates for any model. 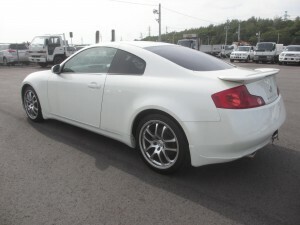 Easily monitor suitable vehicles at auctions across Japan. This covers all the best auctions so you won’t miss a thing. FREE TRIAL our system to see how it works. Ask us anything you need to know to feel comfortable with the costs and process. Please note you would need to become a client by paying our service fee PRIOR to a suitable vehicle coming up on auction day to enable us to inspect and bid for you. Auctions move quickly in Japan and most vehicles come up with limited notice. We recommend you prepare in advance once you have decided to use our service. For more information see How to Buy and Preparing to Bid at Auction. To better understand what we provide on auction day, you can view past inspection examples and read our customer Testimonials to hear what our clients have to say about the process. Our agents inspect vehicles of interest in person to ensure quality. It is critical to use someone you trust to provide honest and accurate inspections so you know the true condition. This inspection is additional to the standard inspection by auction staff (recorded on the auction sheets shown on our system). Auction sheets are used as a guide only, we conduct our own thorough inspection to identify any faults. More pictures and details are provided on auction day, including running condition, factory options, aftermarket parts, interior, exterior and underbody. We then call you to discuss the vehicle condition and features in detail, and if suitable to buy we will guide you in setting your auction bid limit with respect to market prices and your budget. We inspect as many vehicles as necessary to find the one you want. We never charge for additional inspections or bidding so you can relax and take the time you need to find the perfect vehicle. Thorough inspections are the most critical part of the import process. We are therefore very selective and report the actual condition so you can either avoid the vehicle or adjust your budget accordingly. As neither we nor our agent own the vehicle, it’s in our interest to provide you with all available information. When we have confirmed a vehicle is of suitable quality and you wish to bid, our agent will bid for you up to your maximum limit by pushing a button linked to a computer and their auction member account. The auctions move quickly with each vehicle sold in about 10 seconds. The green light will come on once the seller’s reserve price is met then the highest bidder wins. Vehicles not reaching reserve will ‘pass in’. In that case we can then deal with the seller through the auction negotiation desk and will communicate with you regarding the process and their desired price. The above video shows HAA Kobe auction. This is a typical auction with multiple lanes of vehicles selling simultaneously. As you can see, there is no time to communicate with you once our agent starts bidding so the bid you provide to us should be your best. We manage the Japan side for your convenience so you simply have one point of contact with us throughout the process. We will update you with the result as soon as the vehicle has gone through auction. Once you are successful on a vehicle within your budget you only pay the actual auction price plus the fee of our agent in Japan. 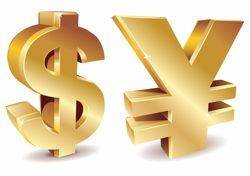 The agent fee starts from about 100,000 Japanese Yen depending on auction location and purchase price. This is separate to our service fee and is a normal part of buying a vehicle at auction in Japan. It covers auction fees, transport, deregistration and related costs in Japan. Vehicles above 1 million Yen purchase price attract a higher agent fee on a sliding scale. Remember, agent fees vary… and so does service. We have been using our agents for many years because they charge a reasonable rate for excellent inspections and efficient export procedures. We have taken time to attend auction in Japan and inspect vehicles with them, so they fully understand the quality we require for our clients. After many years of dealing with the same agents, these personal relationships naturally benefit our clients through a reliable and honest service with risk free payments. Just one part of the unseen service and value that a good import agent provides. We ask that you send payment to our agent within 3 to 5 working days by telegraphic transfer. 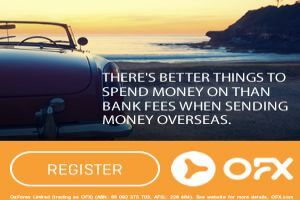 We recommend using OFX or another low fee online transfer option as this can save you as much as 5% on your transfer and is also very convenient. It is a good idea to set up your account in advance, as it usually takes a day or two to finalise. That way you will be ready to transfer funds as soon as a suitable vehicle has been purchased for you. Vehicles are transported from auction to a secure holding area where they are stored awaiting shipping. This will either be our agent’s own yard or a Customs bonded area under 24 hour security surveillance. Transport generally takes 3 to 7 days depending on the auction and distance. More pictures will be taken for you following arrival, and emailed through. Typically your vehicle will remain in the storage area for several weeks. During this time your payment will be confirmed, the vehicle deregistered, and shipping booked on the next available vessel. We keep you regularly updated at every stage so you will always know what’s going on. We ship directly from Japan to the Port nearest you at a very competitive rate. Occasionally depending on the model and compliance availability, it may be logistically more effective or cheaper to send a vehicle to another Port, with road transport to you following compliance. This would be discussed in detail, along with any costs, before you become a client. A shipping schedule is generally provided to you within 2 weeks of payment. Your Customs Agent and compliance workshop will also be advised of the schedule. 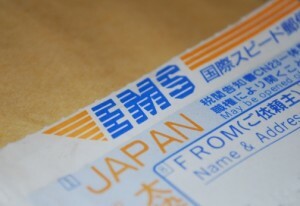 Shipping paperwork (Bill of Lading) will be emailed to you within a week of your vehicle leaving Japan. 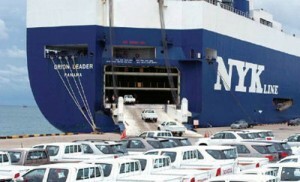 Most vehicles take between 4 to 6 weeks to arrive in Australia from the day of purchase at auction. Allow another 2 to 3 weeks for race / rally vehicles as we wait for an Import Approval to be available prior to shipping. Shipping time to other countries varies depending on distance and available services. The Export Certificate is produced by Japanese Customs from the deregistration document and shows the kms at the last two registration inspections in Japan. Japanese vehicles undergo their first physical roadworthy inspection after 3 years, then every 2 years. The date and kms are recorded on the registration paper and this information is then carried onto the Export Certificate following deregistration. This allows you to check the natural progression of kms over time which will match the kms shown at auction. This peace of mind is one of the benefits of importing your own vehicle. You can also provide this information to a future buyer to support resale value. 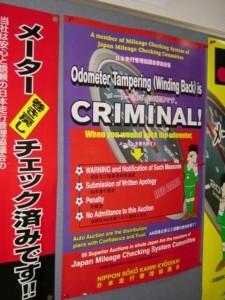 Odometer tampering is a criminal act in Japan as shown in this auction poster. 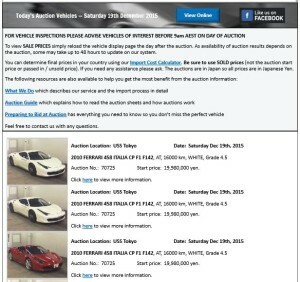 It rarely happens prior to auction as there is a high risk of losing auction membership and further serious penalties. But it does happen after auction and prior to export at the request of some unscrupulous operators or following arrival in other countries. Auctions match chassis numbers to past auction information which identifies any inconsistency in kms if the vehicle has been auctioned before. Auction staff note any incorrect odometer readings during their inspections. Following shipping the original copy of the Export Certificate will be sent to you from Japan by EMS. Included in this package will be any books, service records, spare keys, remote controls or other items provided separately by the previous owner after the auction. We provide the EMS item number which allows you to track your package online. This generally takes 3 to 5 days to arrive at your address. 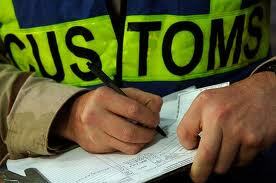 Our recommended Customs Agent will clear your vehicle through Customs and Quarantine. This generally takes 3 to 7 days. Our regular shipping service to Australia includes a Quarantine pre-inspection and clean in Japan at no extra charge. This prevents any additional Quarantine cleaning and transport charges in Australia which could otherwise be quite costly. The Customs Agent will invoice you for shipping, import duties, GST and clearance costs prior to organising delivery to you or your workshop. If compliance is required for your vehicle, this will be undertaken by our recommended workshop or another of your own choice. Compliance is the process of checks and upgrades to ensure that relevant safety and emissions regulations are met and is usually complete within several days to a week. Paperwork is submitted online by the workshop for Govt. processing, which generally takes 1 to 2 weeks but occasionally longer depending on workload or other factors. Once finalised, a compliance plate sticker is produced and posted to the workshop. This is fitted to your vehicle which is then ready for registration. Registering your vehicle is relatively simple, with online roadworthy inspection bookings and vehicle movement permits available for most States and Territories. If required, the workshop we recommend can organise the inspection and registration process for you as an extra service. Once registered, your imported vehicle is treated the same as any other licensed vehicle. Why Use an Import Agent ? You could of course do it all yourself. However, without any experience it’s relatively easy to make mistakes which far exceed the cost of using an agent and result in months of unnecessary stress. 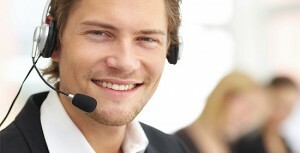 As with any specialised process, obtaining professional help can save you a lot of time, effort and money. 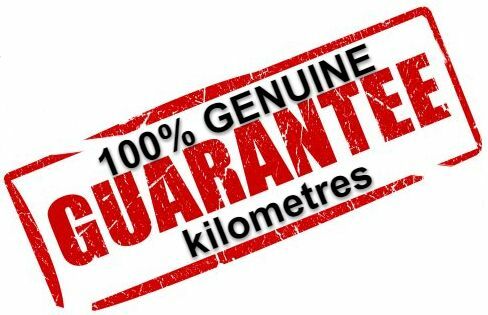 As one of the very first Import Agents to offer a direct import service for Australia, we have built our reputation on honesty, reliability, quality and customer service over the last 20 years. While the majority of our clients are in Australia, New Zealand, Canada, US and the UK, we have shipped vehicles to many other countries over the years including PNG, Micronesia and even Guam. We deal with reliable companies in each country to ensure the process runs smoothly for you. As a fully licensed Import Agent (rather than a traditional dealer), we assist you to select and import your own vehicle directly for the lowest price, without having to know anything yourself about importing. There are no hidden costs so you pay the same for the vehicle, shipping and import costs as a large dealer or importer would. We are not here to sell you a specific vehicle, there are many to choose from and our focus is only on sourcing the best deal for you. The business model of a traditional dealer is to make as much profit per vehicle as possible, giving rise to many conflicts of interest between you and the dealer which inevitably affect vehicle quality and the price you pay. However, with a low fixed service fee per vehicle, our interest is always the same as yours – to source the cleanest and lowest km vehicle for your budget. We provide personal service with one point of contact from start to finish, and since we don’t own any of the vehicles we are unbiased and can guide you in spending the least amount of money to achieve the best value result. With some expert help from a good agent, there is no reason why you can’t select your own vehicle, enjoy the process, and avoid the unnecessary profit margins of middle-men. There are other important advantages to sourcing and importing your own vehicle. Buying direct from the source gives you access to a much larger choice as well as genuine low km or collector vehicles, which are often hard to find locally. As the first importer you can be sure of what you’re buying – not only will you see the independent auction sheet prior to auction but our agent will also inspect the vehicle for you in detail. 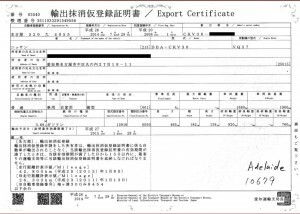 We provide the original Japanese Export Certificate supporting the kms shown at auction. This is essential to know what you are buying and for future resale value. We understand that a new vehicle is a big decision that can’t be rushed. That’s why we take time and care to source the right vehicle and there is never any time pressure. We encourage you to ask as many questions as you like to research prices and to feel comfortable about the process and the type of vehicle that is best for you. 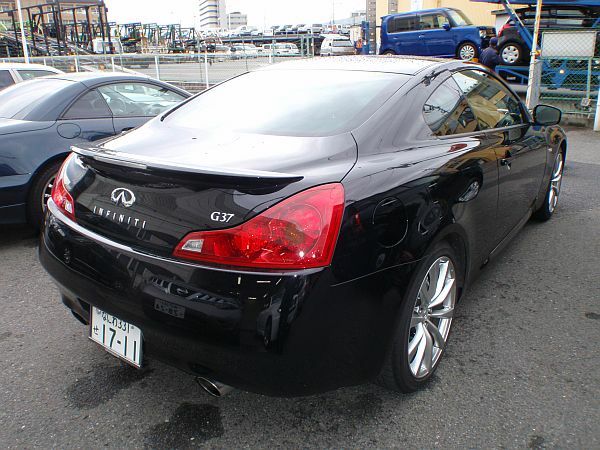 We can advise you on the most cost effective and reliable import method for your situation as well as the pros and cons of different choices, as we have personally owned many of the popular import models. As a client you can take advantage of our reliable import system which gives you direct access to the lowest vehicle prices and often trade discounts on compliance. You don’t need to be a car or importing expert and usually these savings either substantially offset or fully cover our service fee, while saving you time, risk and worry as we take care of all the things that a first time importer will likely trip up on. All you need do is follow our simple PDF Import Guide once your vehicle is selected. After importing many of our own vehicles over the years, we fully understand the excitement of the process. We provide you with regular progress updates so you are always informed, and we are always here to help you up to the point of registration and beyond. That’s what sets us apart, and why clients come back to us when it’s time to update and recommend us to colleagues, family and friends. Don’t just take our word for it though, you can read some of our client Testimonials and Reviews on Facebook. If you are thinking of direct import but unsure where to start, simply get in touch and we will provide as much guidance as you need to decide whether importing your next vehicle is the best option for you. The speed and quality of our first communication will reflect the level of service you can expect from us throughout the process.